The sciatic nerve, the longest nerve in the human body, stretches from the lower spine through the buttocks, down the entirety of the leg. When this nerve becomes irritated or pinched, it often causes numbness, tingling, or pain along its length. These symptoms are called 'sciatica.' Radiating pain from the lower back, numbness along the side of your legs, or pins and needles sensations in your legs are all signs of possible damage to the sciatic nerve. It is important to seek chiropractic care and physiotherapy as soon as possible to avoid further damage to the nerve and prevent future sciatic nerve pain. ​There are many possible causes of sciatica. Most often, the cause is lumbar disc herniation. 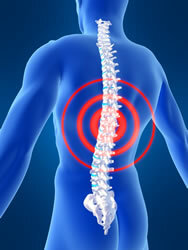 This is often called a bulging disc, slipped disc, or ruptured disc. Another cause of sciatica is bony growths known as osteophytes. Lumbar disc herniation may be caused by a ruptured disc or the failure of the endplate junction. A “ruptured” or “bulging” disc means that the soft tissue inside the spinal disc has leaked, placing pressure on the sciatica nerve. An endplate junction failure happens when the connective tissue between the spinal disc and bone separates. Osteophytes, another cause of sciatic nerve pain, are excess growths of bone. These are more common in patients with osteoarthritis; the body grows bone spurs in an effort to compensate for cartilage loss. Sciatica and lower back pain are particularly common among pregnant women, especially late in the pregnancy, when the growing uterus places pressure on the sciatic nerve. Many pregnant women experience shooting pains in the lower back or legs during this time. Note that back pain related to sciatica is only one type of back pain that may be experienced during pregnancy; other causes include weight gain, hormonal changes, and stress. People who are older, overweight, or obese are also at an increased risk for sciatica or lower back pain. Those who are sedentary are also more likely to experience sciatica. Sitting for long periods of time is closely linked with this condition, as there is a 40 percent increase in the load placed on the spine when in a sitting position. The Henderson chiropractors at Advanced Spine and Rehabilitation will investigate the cause of your sciatic nerve pain and develop a physiotherapy treatment plan. Medical studies have shown chiropractic care and physiotherapy to be an effective method for alleviating sciatica symptoms. This treatment can ease pressure on the sciatic nerve to alleviate pain, prevent further damage to the sciatic nerve, and enable bulging discs and inflamed tissues to heal. Chiropractic care has been beneficial for thousands of our patients in Henderson and Las Vegas, Nevada. Call Advanced Spine and Rehabilitation to experience relief from your sciatica pain today.